Today I have a delightful giveaway from sponsor, JAQS Fabrics, a lovely online fabric shop. Can I just tell you how much I love Q’s shop? It is so easy to navigate with many ways to find what your looking for. You can search for fabrics not only by manufacturer and collection but also by style and color. It’s like going to the color wall at you local quilt shop! The whole site is so well organized and very easy to find what you’re looking for. JAQS ships anywhere in the world. Orders from within the US are always $5 or less. For every $20 spent, you get a $1 back in fabric bucks for your next purchase (applied to your account). JAQS adds new fabrics weekly. This week’s new goodies include Chevron by Riley Blake and Lori Holt’s new Millie’s Closet as well as fabrics from Cloud 9. Other recent collections include Walk in the Woods, Fly a Kite, and Fresh Cut by Heather Bailey. Awesome basics like Cotton Couture by Michael Miller, Fruit Punch by Timeless Treasures, and Kona Solids. JAQS has generously offered to give away a bundle of 5 half-yard cuts of Heather Bailey’s Freshcut fabrics (one of my all time favorite collections, by the way) to one of you lucky readers! Giveaway open until Saturday, March 31 at midnight, MST. GIVEAWAY CLOSED. And as a gift to all of you, JAQS is offering a 10% off discount with $35 purchase, by using the coupon code “JAQSTenOff” – now through April 1st! I love the Riley Blake chevrons. Heavens, those look fun! I like Ten Little Things from Moda. Thanks for the giveaway! I LOVE the L&#39;Amour De La Vie Prints. So, so cute! Please pick me!! I need fabric. I love the Chevron by Riley Blake in Navy!! I&#39;ve signed up for their newsletter! I still love the fresh cut line. I really hope I can get my hands on some of Millie&#39;s Closet sometime. It&#39;s just so fun!! happy drawing – even though it&#39;s not out yet! I love A Walk in the Woods-just finished a quilt using a charm pack of it. I signed up for the newsletter, this is a shop I&#39;ll have to keep track of! I love the fact that they have Mystery bundles. So fun! Thanks for introducing me to what seems to be a great shop. I can&#39;t wait to prowl around a bit more. I created an account, it&#39;s so cool that you can make a wish list, wow! I love all the freshcut line, it was one of my first favorites when I started sewing. Thanks for the giveaway! I signed up for the newsletter, too! Thanks for the chance!<br /><br />It&#39;s hard to pick, but I love Riley Blake Simple Life. And of course the chevrons—they always get me!!! Millies Closet is my favorite. Would love to win . Thanks for the chance. Oh my, the Chevron fabric is just beyond adorable! Thanks for another give-away! I will definitely look at buying from their shop in the near future! I love the chevron fabric! The chevrons are definitely my favorite right now! I also created an account with them 🙂 I love that you can search the fabrics by colour! So handy! And the discounts are great, too! I love the Urban Zoologie fabrics! The little turtles, dinosaurs and bird houses are so cute!!!! Subscribed for the newsletter, too! It&#39;s so hard to choose just one favorite, but I really do love A Walk In The Woods. Millie&#39;s Closet is a close second. I subscribe to JAQS newsletter. I just set up an account…I had no idea they did a reward program. So good to know! I created an acount with JAQS. My favorite is Chevron by Riley Blake. Millie&#39;s closet is a close second. <br /><br />Thank you for offering the giveaway! I am a subscriber to the newsletter and love hearing about fabrics!!! Hey! Cool giveaway! Thanks! I just checked their site and have to be honest, that i do like Freshcut – Brown Graphic Mums from Heather Bailey the most… Would fit perfect as a summer blouse! I have created an account and I am so excited to have fabric points. Great customer program!!! I happen to be in LOVE with Kona Solids at the moment!<br />Always on the hunt for great basics. Thanks for the give away! Love you blog! Thanks for JAQS hookup! What great prices and fabrics. I&#39;ll be shopping there payday for sure! My favorite fabric collection is the Oriental collection. I love the Bee&#39;s in the Bonnet too. I created an account with JAQS! I subscribed to JAQS newsletter! I love the Laura Gunn line Garden Song. Laura&#39;s fabrics have the loveliest feeling of a painting. I also subscribe to JAQS newsletter. I have been waiting for the Chevron stripes from Riley Blake so I would have to say that is my favorite right now. Thank you!!! And I have an account with JAQS. I&#39;ve been drooling over chevrons! And I registered for the newsletter. Thanks for the chance to win. I like the kokeshi confetti – haven&#39;t seen that anywhere else! I LOVE her scrap bundles- not very exciting but I just find it a thrill to see what you might get. That was what I ordered there last time. Fun! Love A Walk in the Woods. I would love to make a picnic quilt for my kids and I to sit on at the park, even though they are teenagers and wouldn&#39;t want to. The fabric helps me dream! Thanks for the chance to win! It so hard to choose-but I picked Wrenly Dandelion Stripe by Valori Well from Free Spirit Fabric as my favorite. I subscribe to the JAQS newsletter. Everyone loves the chevrons from RBD don&#39;t they?! Also, I can&#39;t wait for Summerville. Good Fortune – Dragonfly Bundle (4 – Half Yard cuts) is my favorite fabric pick. thanx for the opportunity to win some fresh cuts fabric. I like Millie&#39;s Closet….but I&#39;m also intrigued by JAQ&#39;s mystery fat quarter grab bags. I&#39;m definitely going to try that! JAQs is new to me…thanks for the introduction. I signed up for the newsletter. Love Indian Summer – cream dots by Zoe Pearn from Riley Blake – so cute! I love those chevron prints so much!! I LOVE the Chevrons from Riley Blake! Yay for fabric! My favorite line right now is the Chevrons by Riley Blake. Especially the orange! Thanks for introducing me to this shop! SO many great fabrics. I really like the Millie&#39;s closet and the chevrons. The Monsters would be perfect for a friend of mine. I&#39;ll need to do some more research. Fun research!! I love the fabrics by Lotta Jandsottir, absolutely any of them. They are so fresh and vibrant and would look great in absolutely anything. I created an account! Wondering if the etsy shop purchases count toward your account total. Ooh, I love Heather Baily fabrics. Delightful giveaway! I also like Millie&#39;s Closet and the Birds Free Spirit fabric. Wonderful giveaway…thank you! I just love the Fruit Punch Organic bundles. What a nice alternative to straight solids! I have signed up for FAQ&#39;s newsletter! subscribed to the newsletter, thanks for the giveaway! Metro Living – Navy from Robert Kaufman is my favorite. Thanks for the giveaway! I LOVE their bundles! As a newbie, picking out coordinating fabric is sooo daunting! I love the Citrus inspired Animal bundle!!! So cute! And signed up for an account! Now, time to go SHOPPING!! My favorite fabric is Garden Wall – Wing Song aqua from Laura Gunn from Michael Miller. Love the birds! Thanks for the opportunity to enter your wonderful giveaway. I love Millie&#39;s Closet. Thanks for the chance to win. And I created an account too! Their prices look pretty good. Lovin&#39; the Chevron&#39;s from Riley Blake these days! So Springy and pretty! Subscribed! Thanks for the giveaway. I&#39;ll think I&#39;ll be spending some time at JAQS! Fresh Flowers in red by Deb Strain… you can never go wrong with red and white fabric! Fly a Kite is so cute. I like Fresh Cut Graphic Mums. I bought the Riley Blake chevrons a week or two ago…colors are great! It is so hard to choose, b ut I really love the Fresh Cut fabric line the best 🙂 Thanks! I really liked the neighborhood fabric. Its really cute! I Loooove the Monsterz!! they are so cute!! I subscribed to JAQS newsletter. I really like the &#39;Cherry Dandelion&#39; – Free Spirit. A great shop. I&#39;m always happy to find a new one, especially with reasonable shipping. I&#39;m loving Millie&#39;s Closet at the moment and I think I need some grey and aqua chevrons too ! Into tangerine this week…so I&#39;m loving Chrysalis in orange by Sweet water!<br /><br />Thanks. I&#39;m in love with Melody Miller&#39;s Ruby Star Spring Flower Dots. Thanks for the lovely giveaway. the Joel Dewberry fabrics are very sweet. :) love them. I&#39;m signed up to JAQS newsletter, thanks. The dresses on pink in the Millie&#39;s Closet line is just too precious. And I have an account with JAQS (Q offers excellent customer service &amp; it is always a pleasure to shop there). Thanks again. I love the yellow chevron stripe by Riley Blake. Love EVERYTHING in Millie&#39;s Closet! Just subscribed to their newsletter–lots of things that I&#39;m drooling over there. I just love any Riley Blake material and have a few grand girls who love getting quilted &quot; stuff&quot; from grandma!. Also signed up to get the newsletter…thanks. I love Millie&#39;s Closet Dresses in Pink – thanks for the chance to win! Already a subscriber to their newsletter! Thanks! Already have an account! Thanks!! Riley Blake&#39;s Fly a Kite–love it! I would love to have the RBD&#39;s chevron prints. They would make a great bag or skirt. I love the Backyard Baby Birch Forest! I love birch trees! Thanks for the giveaway! Wow! So many beautiful fabrics. Thanks for the introduction. My favorite is Shavings from Michael Miller. Riley Blake Fly A Kite is just precious. Love it! I, too love the Heather Bailey Florals. Beautiful! I love the pink Get Together bundle. The squirrels, birds, and pigs…it&#39;s too hard to choose my favorite! I like the chevron and the tranquil dragonflies. Ooo pick me. How about I just love fabric! I love Millie&#39;s Closet. 🙂 Thanks for the chance! I signed up for JAQS newsletter! Alphabet Soup – boy – white from Riley Blake is my favorite! I created a JAQS account. They seem to have a fabulous rewards program! I subscribed to the newsletter!! I love the &quot;Hoo&#39;s on the Forest&quot; Goodness it is cute!!! I like the chevron pattern very graphic. Eu gosto de sólidos KONA.Obrigada. I just sign up for an account. I love the giveaway fabrics. What I really NEED right now is more in the yellow-orange range. It looks like they have a good selection there. I love all of the chevrons, especially the gray and yellow. Thanks for the chance to win! I have an account. I LOVE them. I bought a fat quarter bundle to see what they were like. 12 Fats, all wonderful for $15.00. I&#39;m back on there daily. If my husband only knew! The newletter is great. I just signed up about a week ago. Still love them. Would buy daily if I could afford. I &quot;window&quot; shop there daily. I told myself I could buy some more in April. Counting the days! My favorite fabric is a &quot;Coming Soon&quot; feature – the gray elephants from the Happy Drawing line from Cloud 9. Thanks for the chance to win! I also created an account. Thanks for the extra chances to win! The metro living from Robert Kaufman is really cute. It is so versatile, and can be paired with so many other patterns! My favorite is the Fresh Cut from Heather Bailey. Just found your blog tonight and I love it! Makes me extra happy when I find a new fabric source. Looks like I&#39;ll be back to JAQ to order some of their fab fabric. My fav tonight was the Cloud Nine Fabric &quot;Menagerie&quot;. Thanks for the chance to win! &#39;A Walk In The Woods-Little Red – white from Aneela Hoey from Moda&#39; stole my heart. Love the Riding Hood on that one. I am desperate for a huge quantity of Aneela&#39;s Dash Stripe in Gray. The perfect blender fabric, I think! And I get the newsletter from JAQS! My favorite has to be Echo – Brass mini Florine! I created an account so now I can shop. Yea! I love the Riley Blake chevrons. Thanks for nice information. This looks great! Color full <a href="http://www.oomphonline.com/luxury-decorative-pillows.html&quot; title="Accent pillows" rel="nofollow">Accent Pillows</a> always hot. I really like the retro bundle on the site. I am even thinking about ordering that and the holiday bundle. I need to get a jump start on birthday and holiday gifts! I created an account with them. Thanks for the chance. I love Ten little things from Moda. I love Backyard Baby – Fun on the Vine. And dozens of other things! Nice selection in the shop. My favourtie fabric is Woodland green fairies. I love Natalie Lymer&#39;s designs and her fabrics are wonderful too. I&#39;m really loving those chevrons – especially in navy! I created an account at JAQS! I love flower prints so Good Fortune – Blossoms is my favorite over at JAQS. but mums are blossoms too &amp; Freshcut is lovely. Thanks for the chance to win some. I have subscribed to JAQS newsletter as iambuzzysma@yahoo.com. The blossoms in Freshcut are lovely – thanks for the chance to win some. I&#39;ve been loving Millie&#39;s Closet in the green colorway. I love &quot; Ten Little Things&quot; by Jen Ski. I already receive the JAQS newsletter. Just signed up for the newsletter. Thanks for the chance! I love the back yard baby- Birch. I love all the fly a kite. I really like &quot;Hoo&#39;s on the Forest&quot; and I really like your giveaway. Thanks for the opportunity to win. I really like the Night and Day 3 by Robert Kaufmann! Thanks for introducing me to a new site! I also created an account with them – I&#39;m sure I&#39;ll be buying from them in the future! Great shop I also just signed up for their newsletter! I really like Millie&#39;s Closet. I am in LOVE with the chevrons! Hope I win! I like the fresh bloosoms bundle – lovely! The Neighborhood by Monica Lee looks so sweet! I signed up for the newsletter – thanks for the giveaway! I love Millie&#39;s Closet from Riley Blake. Great Giveaway!! Love JAQS! Thanks for the chance to win!!! I already get the newsletter from JAQS. Thanks!! I have an account from JAQS. Thanks for the chance to win! I like Kate Spain&#39;s Good Fortune, but also so many others! I created an account. What a great site! I&#39;m going back to order some fabric! I really like Millie&#39;s Closet yellow dots. Thanks! I really love Riley Blake fabric! Thanks for the opportunity for free fabric, my favorite thing in the world!!! Just signed up for the newsletter. I love, love, love to look at new fabric and plan projects!! I really like this shop. I signed up for a newsletter and really loved the Retro bundle they have. Thanks! I&#39;m subscribed to the newsletter. I absolutely love the red Millie&#39;s Closet purse fabric – it would make the cutest tote bag! I&#39;m also a huge fan of the Millie&#39;s Closet cheater patchwork! I already have an account &amp; get the newsletter. Rec&#39;d my first order a couple weeks ago…JAQS is GRRRREAT!! I&#39;m loving Fly a Kite and A Walk in the Woods fabs…think I better go have a look around!! I went to the store and I like the Citrus Inspired Animal Prints. I created an account with the store. My favorite fabrics are the October Afternoon set from Riley Blake. So, so cute! Oh I love the Radiance tossed Floral one..Yummy! Loving the Riley Blake Chevron – I hadn&#39;t seen that one yet. Cute cute, thanks for the chance to win! I just signed up for the newsletter!!!! I am in love with MONSTERS!!!!!! That is such a cute line! Love the fly a kite fabric! Signed up for their newsletter! Cute site. There are so many great ones but for some reason I can&#39;t stop thinking about the Fruit Punch Texture fabrics! I love the Chevrons the best. Sweet leaves is my favorite! I love the Giraffe Garden – Citron for Michael Miller fabric! I love the fly a kite in orange. I think I might have to order some. Happy Sewing! K- I created an account…ANd I think I&#39;ll get that cute fabric now. I like Across the Pond, especially Aster Pumpkin. I just created an account with them! I love the Across the Pond – Aster Pumpkin. Great colors and I love the little dragonflies. I signed up for their newsletter. Hope I win! I created an account there too. I so like the Ten little things line. It&#39;s going to make some great kid quilts! I love the Good Fortune Prints from Moda!! I want them all :)<br />Thanks for giving us a chance at the give-away!! My fingers are crossed!<br />LOVE your blog!! Oooh, I love Millie&#39;s Closet! Ooh… I love Monsterz by Cloud 9 and Walk in the Woods by Aneela Hooey.. so fabulous! I LOVE Millie&#39;s Closet! I particulary love the grey with the different color floral prints! But seriously, there is so much in the store that I love! I like a walk in the woods in pink or gray! I&#39;m a shoppin&#39; girl, so I LOVE Millie&#39;s Closet Purses Red. And thank you very much! I have been wanting Millies Closet since Lori starting talking about it- so for today its my favorite!! That &#39;Monsters&#39; line is so cute – would be sweet for a little boy! Love the chevrons! Seems like everyone loves the chevrons! Thanks for the great giveaway! I&#39;m looking forward to checking them out! I especially love the Garden Wall – Wing Song aqua from Laura Gunn from Michael Miller fabric. I created an account with JAQS fabrics. Thank you! I love the Riley Blake Chevron fabric in aqua. I signed up for the JAQS newsletter. Signed up for the newsletter. Love finding great new shops! I am adoring that chevron fabric! I&#39;ve never seen it before! And Monsters! Another great line that is new to me! THanks for the amazing giveaway. I love Go Fly a Kite, Ice Cream in cream. Love your blog! I&#39;m subscribed to the newsletter. Thanks for the giveaway chance! I just created an account. Thanks~! There are so many beautiful fabrics, but my favorite is still A Walk in the Woods. Thanks for the chance to win. I have ordered from JAQS, so I already have an account. I adore L&#39;Amour De La Vie Prints Fat Quarter Bundle!! I love Laura Gunn&#39;s Wing Song in Aqua. It&#39;s so beautiful! I just subscribed to their newsletter. I like Nesting Place in Antiques as I like birds on fabric. Enjoyed their options so much, I decided to subscribe too!<br />Thanks for the introduciton. Just signed up for the JAQS newsletter. Thanks for letting me know about them and thanks for the great giveaway. I really like the Peach Dotted Paisley! I created an account with JAQS. I love Chevron and Echo. Dream on (hello Yellow) by urban chicks was my favorite. But I could pick a dozen more. Thank you for telling us about this great quilt shop! 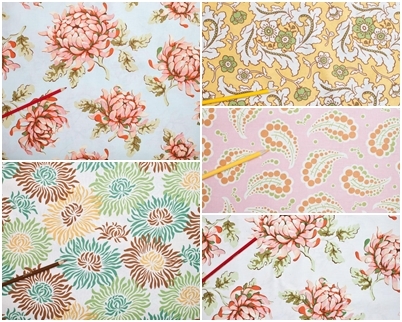 I love the Maman – Menagerie (organic) from Cloud 9 Fabrics. We have a little black dog that resembles the one in the fabric. This fabric reminds me of the old hardback readers that had printed paper as the first page. Ok, now I&#39;m dating myself!! I signed up for their newsletter. Thank you for organizing the giveaway! How fun! I signed up for an account with the shop. Now to just warm up the credit card 🙂 !!! I totally love the &quot;Ten Little Things&quot; fabric! Love the Climbing Lantern Pod by Laura Gunn. I love bright blues. I am a new quilter and need fabric. I&#39;ll sign up for the newsletter. Hope i get picked!